KISSING CANDICE, who are tour circuit veterans that have performed on the entirety of the Mayhem Festival and who have made appearances at The Gathering Of The Juggalos and hit the road with the likes of NEW YEARS DAY, will release their new EP Safe Word on November 17 through Stay Sick Recordings. About the EP, vocalist Joey Simpson said, "These new songs are totally stripping away everything we ever done. We took our old formula for songwriting and got rid of it! Expect a fresh new sound from us. A little something for everyone to feel." "This is the KISSING CANDICE that we've envisioned from the very beginning — streamlined, ruthless, and focused," said guitarist/vocalist Dreamer. 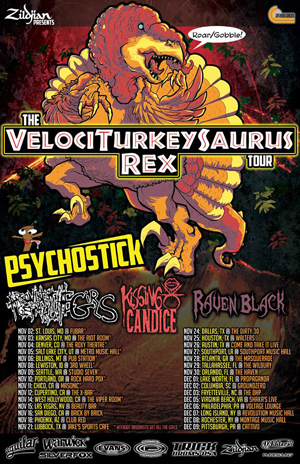 The band will tour this fall with PSYCHOSTICK and RAVEN BLACK. Fans can expect the band to debut new material during this run of dates.